Bred by Laudy B. Lawrence. Owned by Boone Hall Stable. 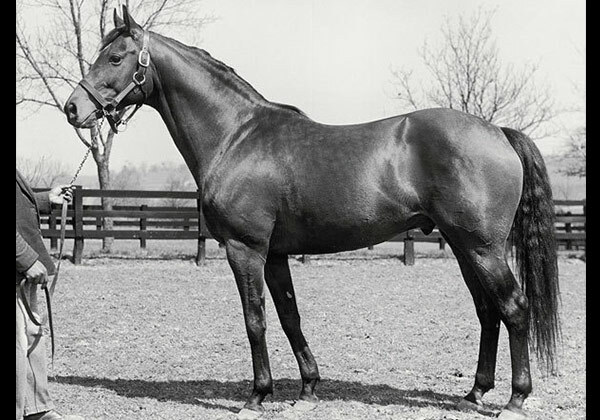 Bred by an American in Paris, *Princequillo was conceived in France, but when World War II broke out, his pregnant dam was shipped to Ireland where he was foaled. While his sire remained in France and became a casualty of German air fire, *Princequillo and his dam were shipped over high seas and smuggled through a German submarine blockade to safety. Eventually shipped to the United States for his racing career, *Princequillo arrived in poor condition after his dangerous journey. Sold shortly after arriving in New Orleans, he was subsequently claimed by Horatio Luro for the Boone Hall Stable. In Luro’s capable hands, *Princequillo developed into an effective distance horse winning the Jockey Club Gold Cup, Saratoga H., and Saratoga Cup. He was retired to the Hancock family’s Ellerslie in Virginia. Although *Princequillo probably would have earned his way to Claiborne after the success of his first two crops, he was moved to Kentucky after his second season at stud. A welcomed addition to the Claiborne stallion ranks, A. B. (Bulll) Hancock later recalled that he had been quite keen on the horse because he won at six furlongs and then continued to prove himself as a stayer. Referred to as “Mr. Fixit” at stud for his ability to sire sound, correct foals, *Princequillo is most recognized as the sire of 1958 Horse of the Year, three-time Turf Champion, and leading money winner Round Table. The leader of the General Sire List in 1957 and 1958, *Princequillo also sired Champions Misty Morn, Hill Prince, Dedicate, and Quill. His greatest legacy, however, is as a top broodmare sire as his daughters cemented his immense influence on the breed. He lead the Broodmare Sire List eight times and had some 170 stakes winners to his credit. They include the dams of Secretariat, as well as his rival Sham, Mill Reef, Sir Gaylord, Key to the Mint, and Kris S.